Help Alisa and Rudy, a magician and a gnomish builder, rebuild their destroyed world from the ground up! 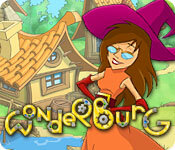 Wonderburg needs your protection from snarling dragons, nefarious wizards and troublesome trolls. This Time Management Strategy game will lead you through the mystery of the destruction of your world, and take you from lush farmlands to snowy cliffs. Use magical spells to help your efforts as you bring back Wonderburg!